Easy 3D Objects is intended for creation of 3D GIF animations, banners, illustrations for the Web and presentation materials. You can create GIF animations, 2D and 3D buttons, image frames, collages and unique graphic designs, add visible watermarks to your photos and hidden signatures to GIFs. We will help you to solve your problems, provide you with easy image tools. Learn more about all our products. 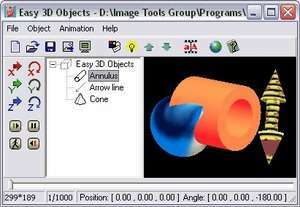 Easy 3D Objects 1.0 is a shareware program and can be used as a demo to try the software until the free trial period has ended. A full version of the program is available after the trial period ends. For security reasons, you should also check out the Easy 3D Objects download at LO4D.com which includes virus and malware tests. Additional screenshots of this application download may be available, too. 4.85 out of 5 based on 7 ratings. Easy 3D Objects has a presence on social networks.